The videos and lesson plans teach how our fledgling democracy in the United States was floundering and nearly failed before John Marshall took on the daunting task of defining what the Constitution, and the judiciary, meant. 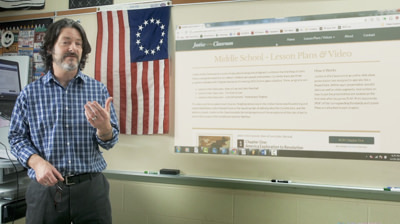 Justice in the Classroom tells the intriguing story of the acceptance of the rule of law to assure the success of the Constitution and our liberties. Justice in the Classroom is an online slide show presentation tool designed to operate like a PowerPoint. Within each presentation are still slides as well as video segments. Instructions on how to use the presentation are located on the first slide after you press PLAY. Print documents (PDF) of the corresponding Standards and Lesson Plans are attached to each chapter. (1607 – 1781) Follow the establishment of the “New World” and its development, stretching 170 years as the burgeoning cradle of freedom grew while friction with England developed. (1776 – 1788) Relive our fight for freedom, the American Revolution, ratification of our new constitution and the development of checks and balances of the three branches of government. (1788 – 1800) George Washington is President. The Bill of Rights is adopted. John Marshall is the champion of the XYZ Affair, elected to Congress and appointed Secretary of State. (1800 - 1835) John Marshall raises the judicial branch to be co-equal with the executive and legislative branches by the concept of judicial review and establishes the Constitution as the supreme law of the land. Key Concept 4.1: B) Supreme Court decisions established the primacy of the judiciary in deter- mining the meaning of the Constitution and asserted that federal laws took precedence over state laws. CON-2.B.2 The balance of power between the national and state governments has changed over time based on U.S. Supreme Court interpretation of such cases as McCulloch v. Maryland (1819). CON-5.A.1 The foundation for powers of the judicial branch and how its independence checks the power of other institutions and state government are set forth in Marbury v. Madison (1803). (1831 - 1835) The Supreme Court, led by John Marshall, further develops the concepts of equal justice, limited government and the enforcement of legal contracts. (1607 - 1835) Watch the journey of America, from Jamestown to the Revolution, from a struggling democracy to a Constitution defined by John Marshall, yielding a government built on the rule of law. Justice in the Classroom I The Rule of Law is a discussion of the concept of the Rule of Law and how it is an integral part of our governing systems in America. Through this standards-based curriculum, middle and high school students learn the fundamental political principles that define and shape American constitutional government. Connections are made through activities like interpreting a political cartoon to illustrate that, under the rule of law and the Constitution of the United States, all individuals, including government officials, must follow the law. CE.2a Fundamental political principles define and shape American constitutional government. Rule of Law: Everyone, including government officials, must follow the law. GOVT.1l Create a blog that explores the greatest impact on democracy: Rule of law or limited government. Use evidence and data to support the argument. CTROL and its innovative Rule of Law Project are a web-based resource and training center for teaching the rule of law on a global scale.